These pictures on this page are taken from all types of pulling magazines and friends sending them to me. 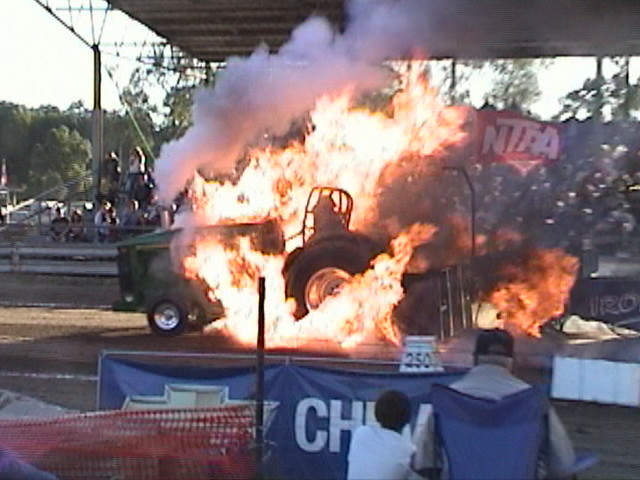 NTPA is continuely adding more safety requirements every year to better the sport for everyone. Most of these pictures are before these were added. 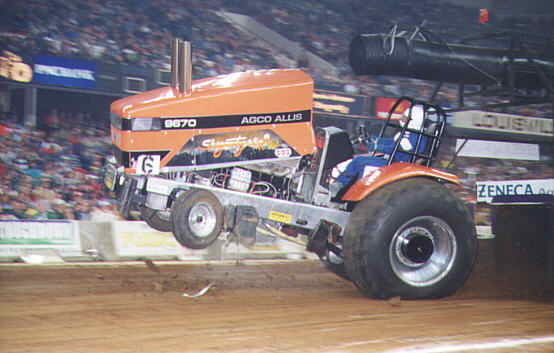 This is our Pro Stock Tractor. We were pulling at Carlisle,Ky. 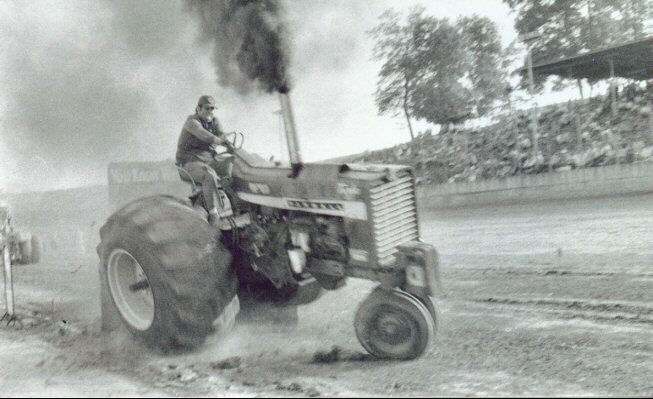 in 1980 when our turbo exploded. 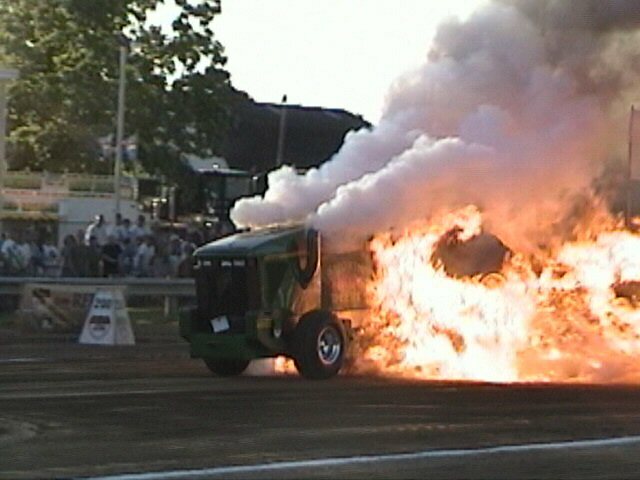 The tractor caught fire and continued to burn. They used every fire extinguisher on the grounds,including ours. 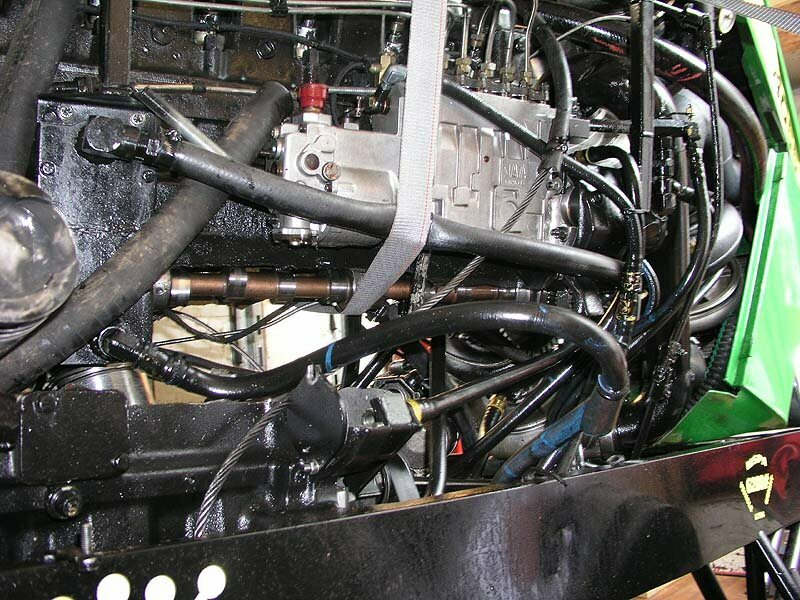 It shorted out the fuel pump wires and it was pumping diesel fuel on the fire. Roland took the battery cable off and stopped it. 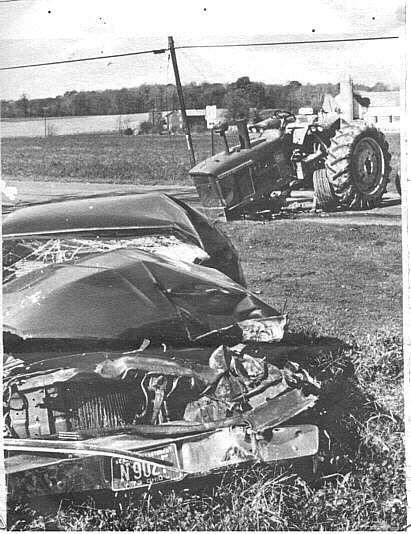 The damage to the tractor was immense. Now NTPA requires battery disconnect switch. 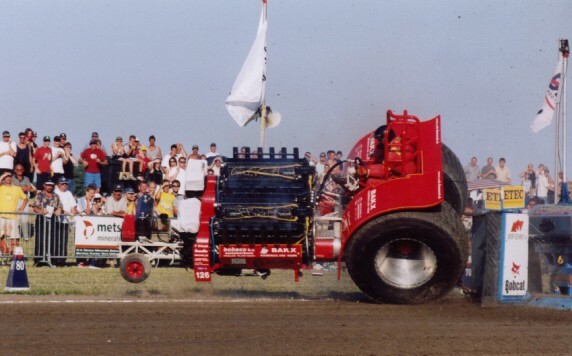 Don Harness from Dana,In. 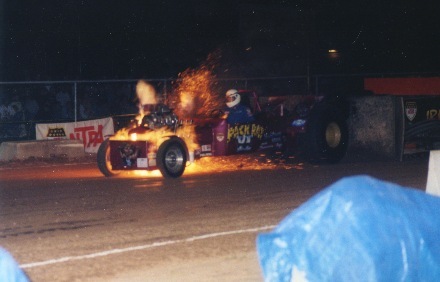 with his "Loud Mouth Lime" on wild ride at Bowling Green,Ohio in 1982. We think "Joe Burhrows". 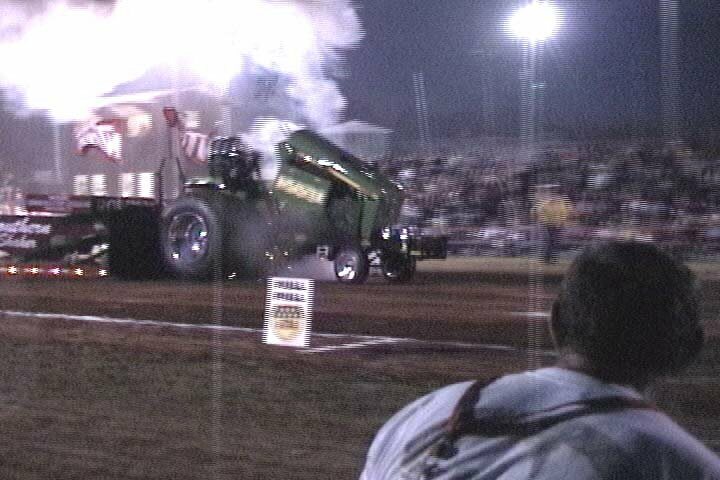 He was pulling his Super Stock John Deere in the 7000 lb class at Bowling Green,Ohio in 1982 when he was thrown off. Only luck kept him from being hurt seriously. 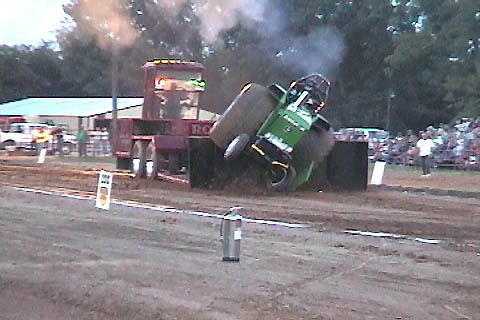 Wayne Rausch's 1923 Model T two-wheeler snapped in two during the Oct/TNT pull and monster truck race in Freedom Hall. 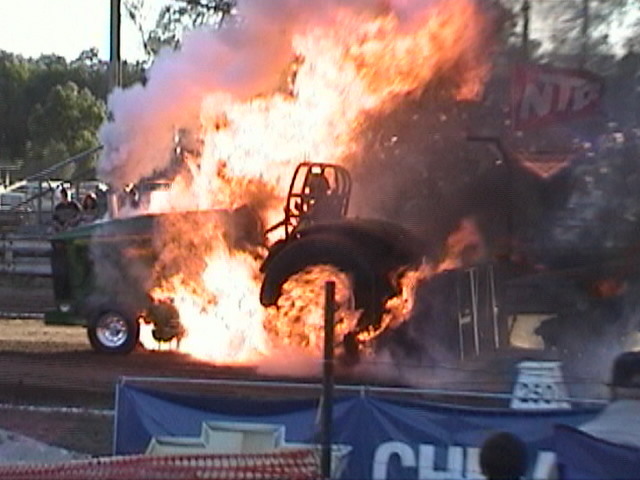 Fuel spewed from the wreckage just after the incident. 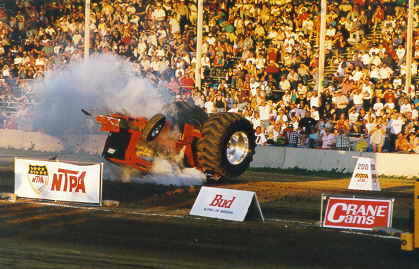 Mike Smith pulling "Deere Harvester" his John Deere Super Stock Tractor at Bowling Green,Ohio in 1982, narrowly escaping injury when rear axle broke at the 196' mark throwing him from tractor. Pictures were taken from slides. 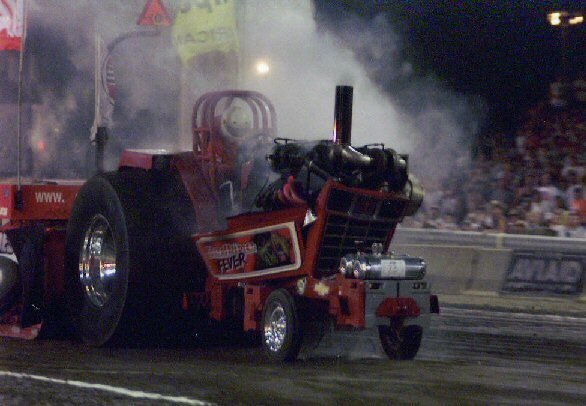 It was a rough weekend for the Thompson Pulling Team from Baton,N.M. at Alburquerque,N.M. 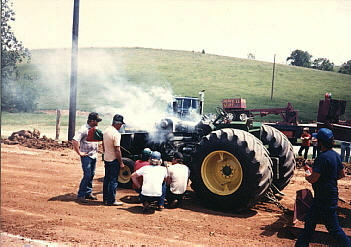 pull in 1985. 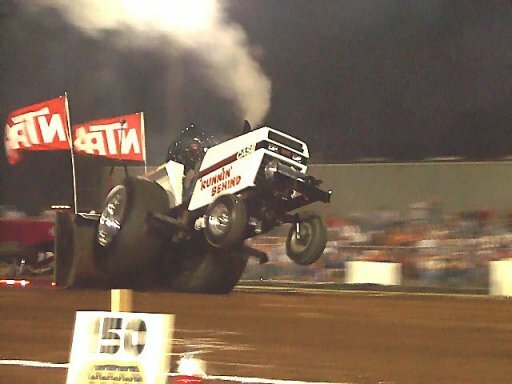 Their new truck( "Egor")made its debut and while backing into his parking space after the run his throttle stuck and he hit the wall. 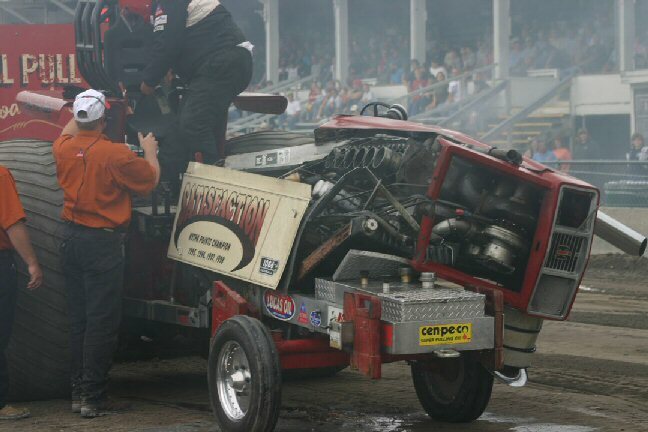 Rob Russell's IH Super Stock Tractor "Workhorse" after he had a violent engine explosion. This was in Memphis,Tenn. in 1988. The block was torn in half and the remains were dumped out on the ground. 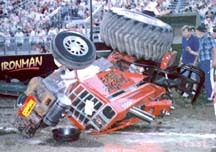 The sequence of photo's here are the result of a broken hitch on the 1986 Chevy S-10 vehicle of Jeff Writsel of Orient,Ohio at the Ohio State Fair in 1990. 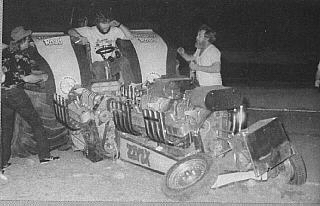 Ron Mehling drives the 4-engine Mod from the Tobacco Road Team and this disaster occured when Ron hit the throttle a trifle too hard before, we said before, he hooked to the sled. There was alot of damage to the Mod and to Ron's ego. This was around 1987. 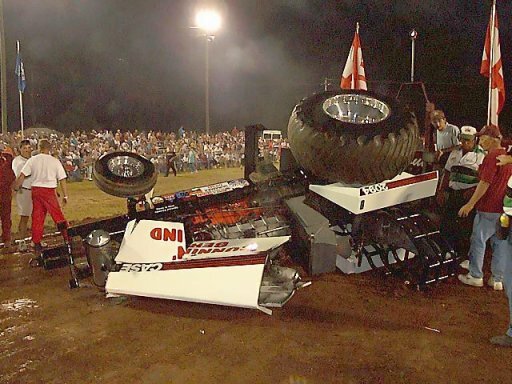 John Stull examines the damage done to "The Gambler" when the right tire spun off the rim at Hamburg, N.Y. and tore off the seat with son Dave aboard, who suffered only bruises. This was 1981. 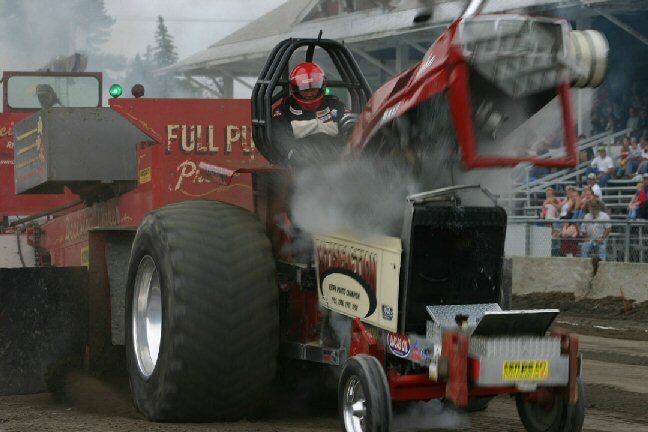 One thing veteran Super Pull spectators and pullers still talk about is the opening pull of Super Pull 2, as Jim Lowe of Liberty,N.C. 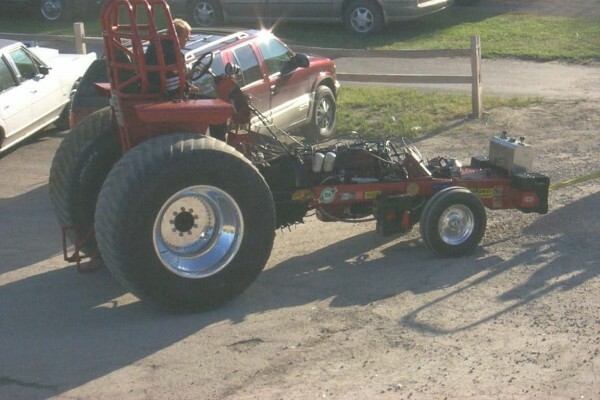 had his Oliver 88 5000 lb. Super break in half at midtrack. P.C.Long, Bevier, Mo. 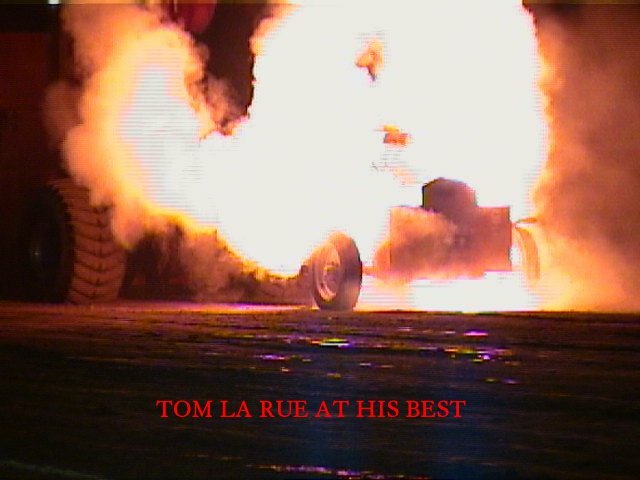 took a wild ride at Tomah,Wis. 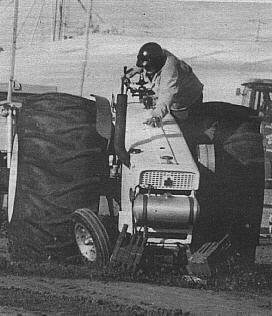 in 1984 when his hitch broke away from the tractor. 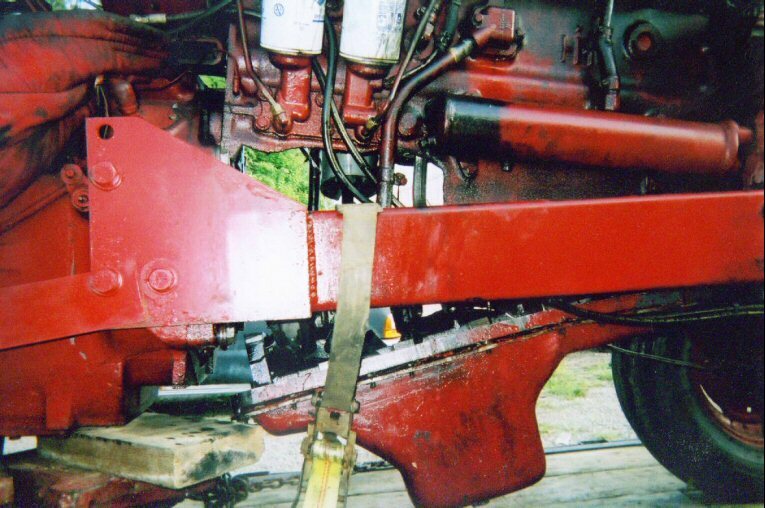 The kill switch stopped the engine and Long hung on and was not hurt, the tractor however was slightly damaged. 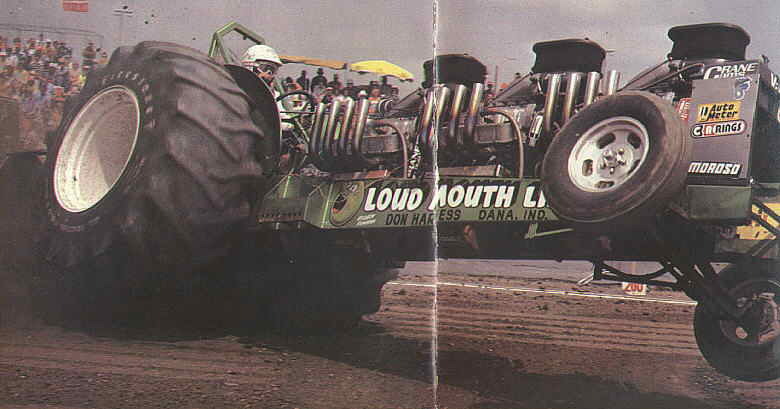 Don Harness and "Loud Mouth Lime" took one of the wildest rides of 1981, in Bowling Green's 7000 lb modified class. 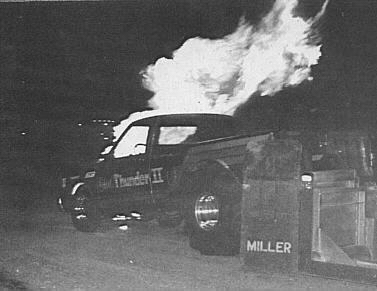 What you see here is the charred remains of what once was Jim Nelson's pulling funny car. 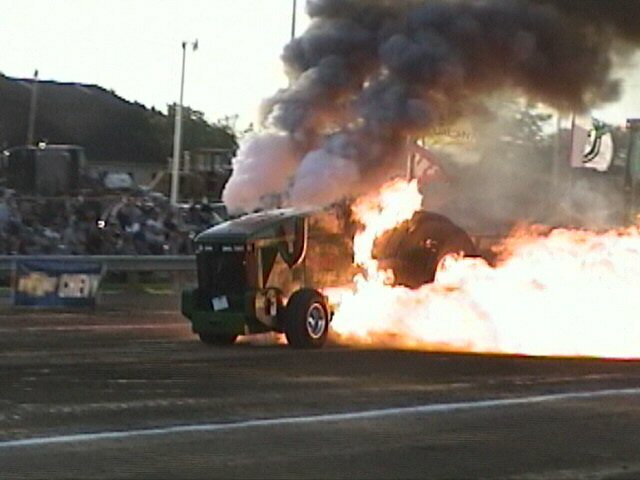 This happened on his very first pulling run after a wheelstand landing hung the throttle wide open. The forced landing was due to the sleds chain breaking in mid flight. 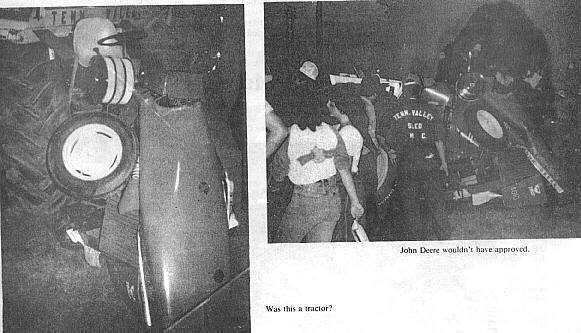 Jim then slammed into a utility pole. A transformer on top of the pole fell on top of the car. 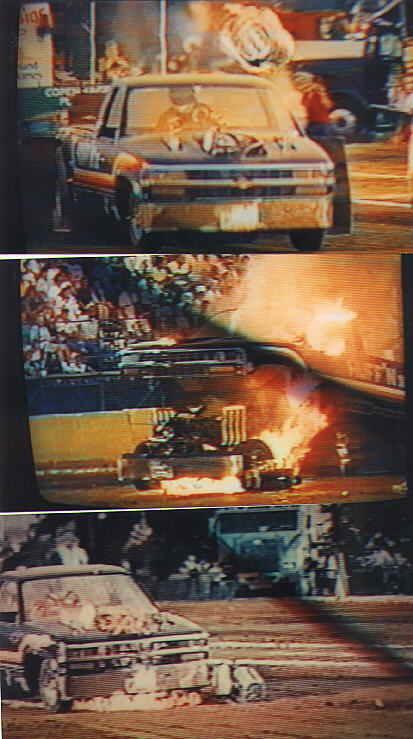 Thirty minutes later the car was still burning, but Jim was ok. All this took place in Portland, Oregon in 1985. 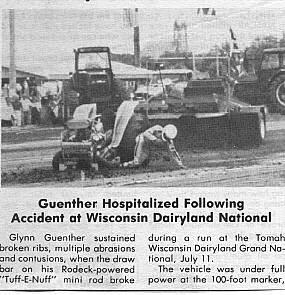 Guenther Hospitalized following accident at Wisconsin Dairyland Nationals. 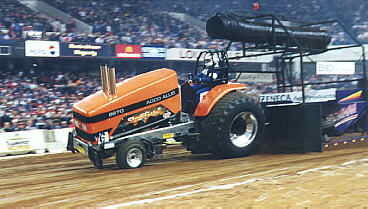 Neil Gettinger from Milton, Indiana pulling his SS JD at the Ky. Farm Show Tractor pull in early 90's. 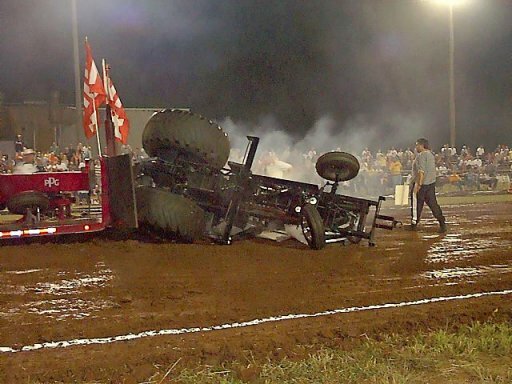 The tractor broke in half during Neil's pull, if the tie bars that have been enforced had not been on, it would have hit the ground and Neil would have been injured. 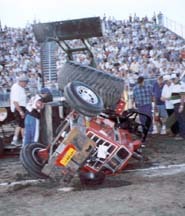 Pull Productions event in Montana in 1985. Eddie Bracken from Missouri went for a ride on his Keith Black powered Mini that had everyone holding their breath. Just out of the gate the chain on the box broke sending it back to it's original position. Meanwhile Eddie was streaking for the finish line. He soon realized that something was amiss and tried to slow down. 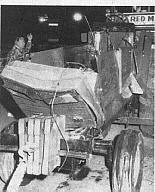 When he hit the brakes the box shot forward jerking him around in the seat where he was again hit the trottle sending the box rearward. By now he was going every which way but straight. 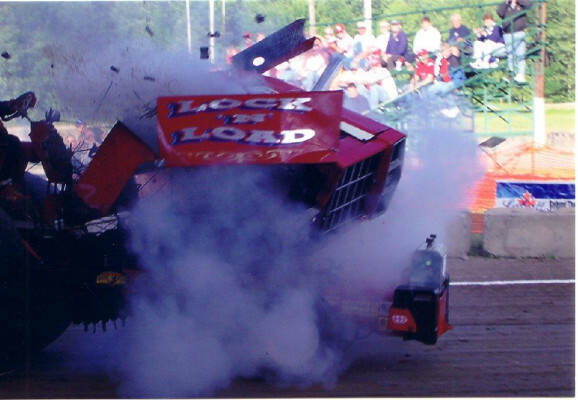 This time when he hit the brakes the box came forward and on to his rear tires. 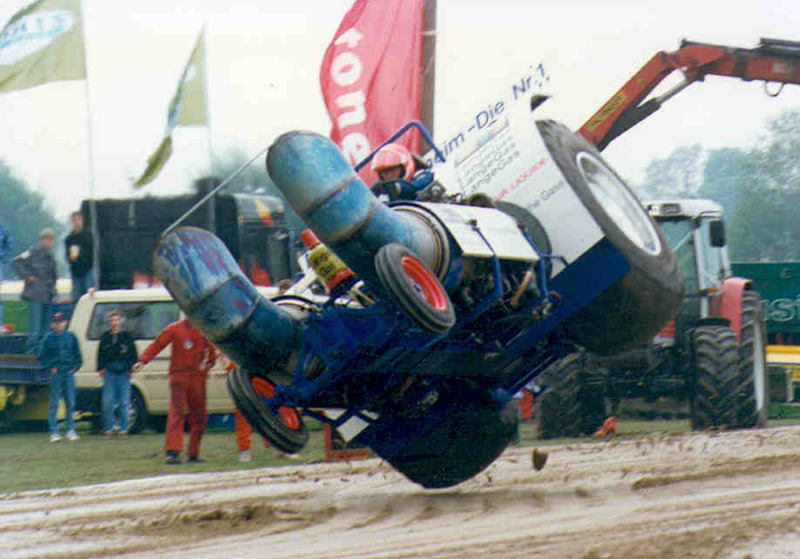 As the Mini started to flip Eddie bailed off. 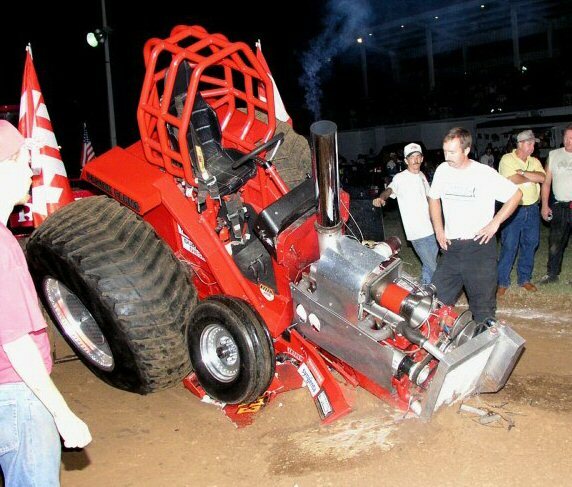 The Mini wound up upside down at the 280' mark. Eddie received a tire burn on his right side and a few bumps and bruises. He was very lucky! 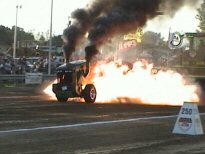 Russell Pierson's run with his "Blue Thunder" GMC Turbine powered TWD Truck. 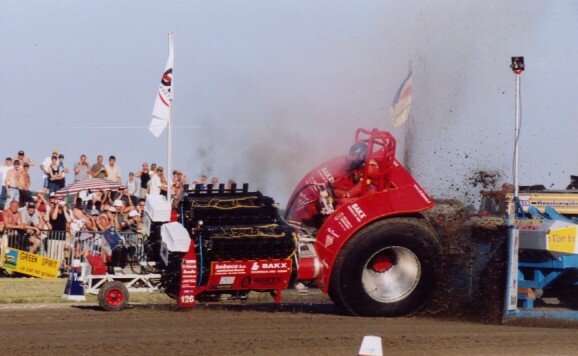 The turbine broke about 200' mark and erupted into a ball of fire. 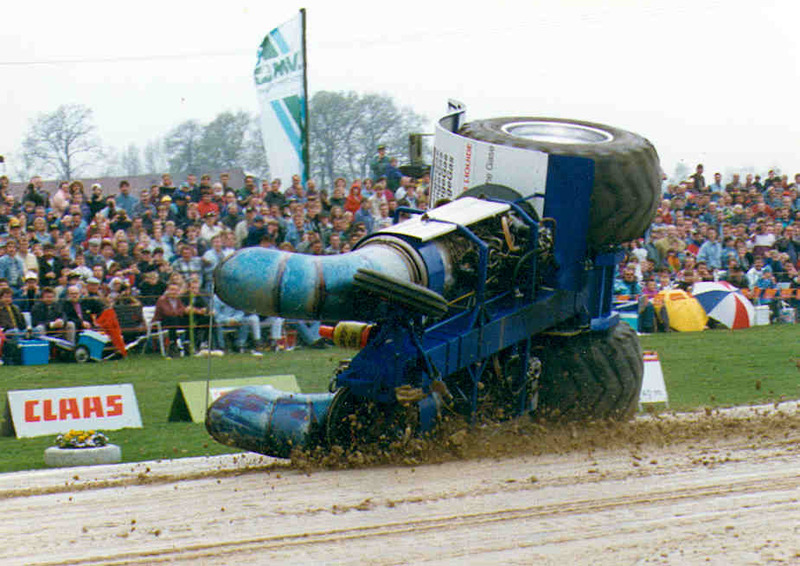 Russell bailed out before truck came to a halt. Truck was badly damaged! 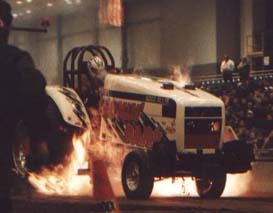 Event was in Whitewright, Texas in 1986. 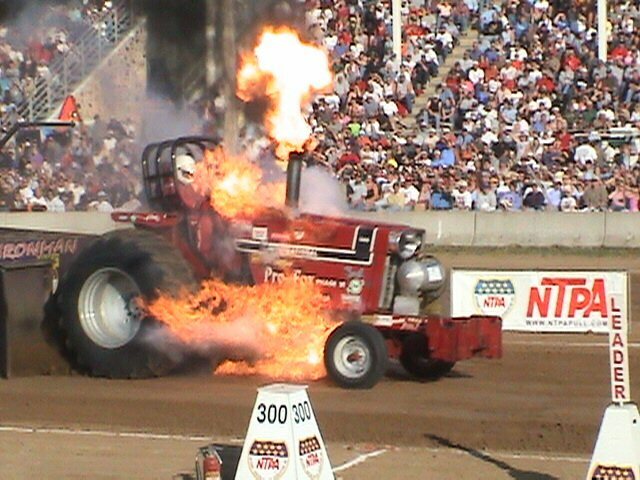 Mark Gettinger's AC D21 Super Stock Tractor "Equalizer" detonated in Memphis,Tenn. 1988. 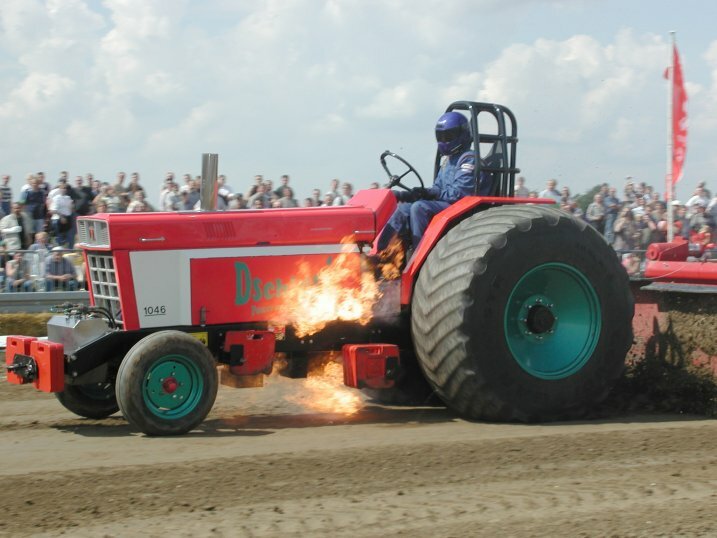 Completely distroying tractor! 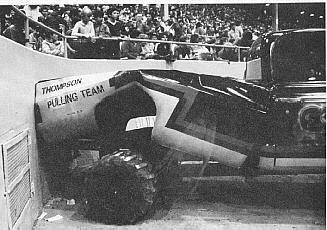 News Article in an old pulling magazine that I use to have subscription to. 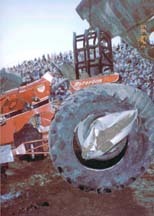 The magazine was called "Pulling". This issue was winter 1985. 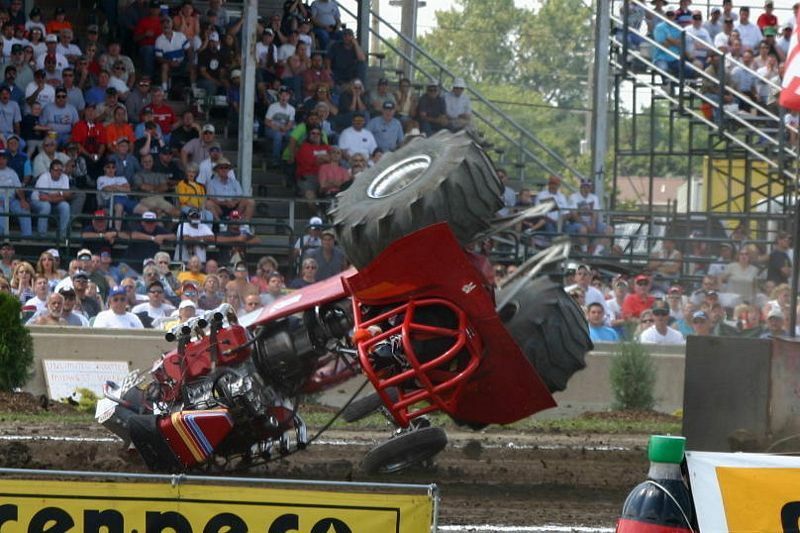 Accident involving sled at Elkhart Co. Fair in Indiana. 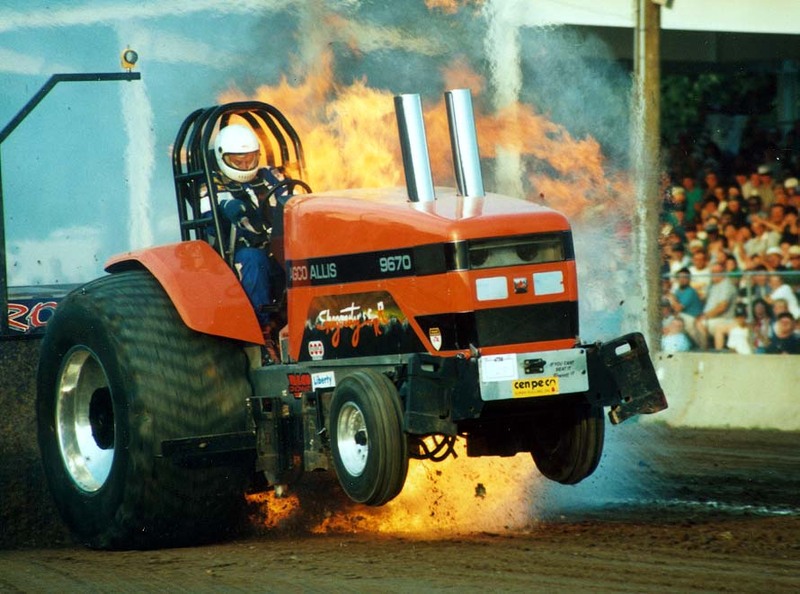 A Pull To Stop The Show! 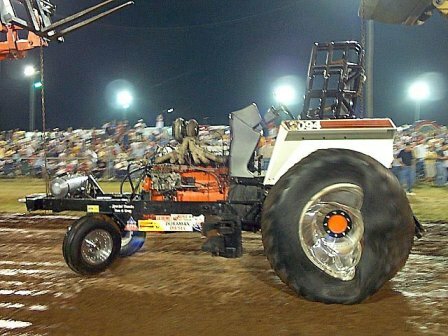 A tractor pull for Gary Kay (Hazel Green,Al.) to remember. 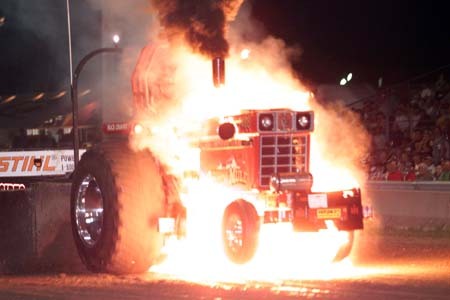 On June 19th, 1982 Gary Kay was pulling his JD 4010 alky burner tractor at Lewisburg,Tenn. 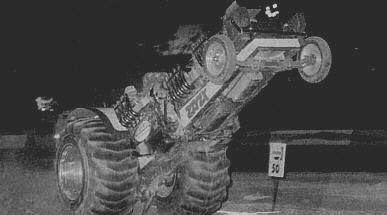 when the front end came down doubling under tractor. 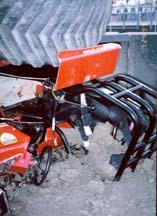 It twisted the frame around causing the front of tractor to dig into ground. The weight rack doubled up under the belly completely wrecking the front. 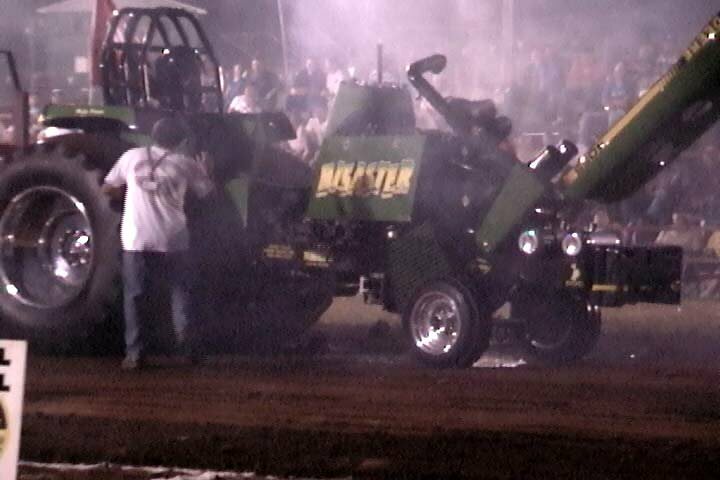 The sled pushed into the rear end breaking the wheelie bars. 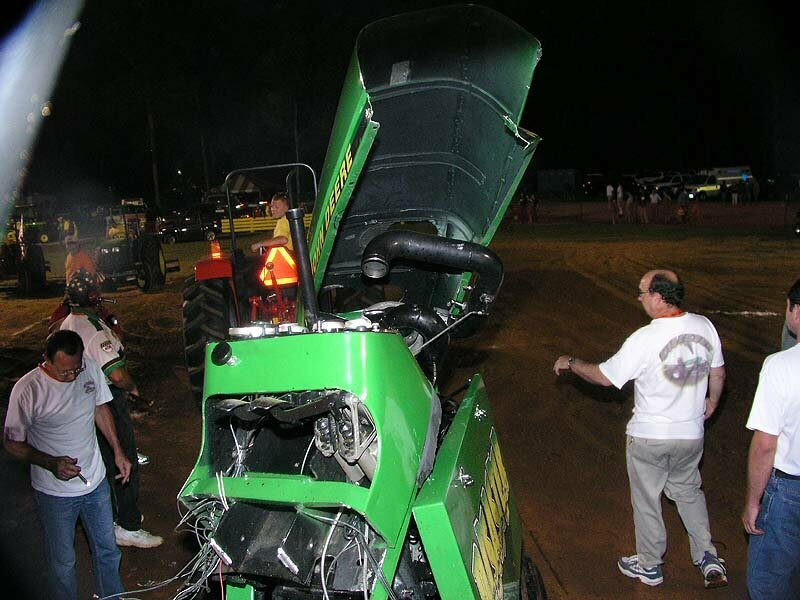 The tractor came to a stop just short of the stands, thankfully nobody was hurt. This picture has nothing to do with pulling but it was a wreck involving a 4020 John Deere tractor meeting a car head on. Roland clipped this picture from a farm paper about 25 years ago. It was on a rural road in Ohio. 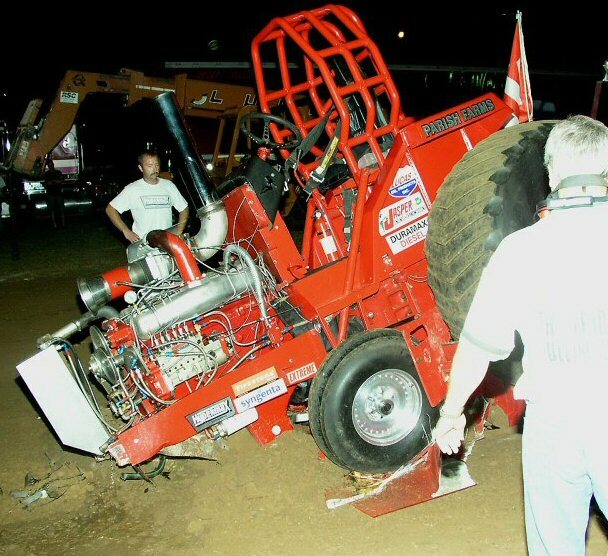 Ron Mehling on Howard Walker's Modified taking a high ride off the starting line. In 1987! 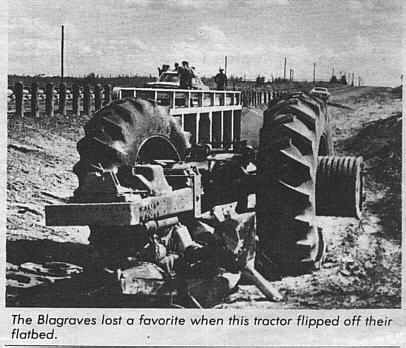 Derwood Blagrave ( Stan & Steve Blagrave's father) driving the rig home,Sept.10,1975, when a car stopped in the road in his path. 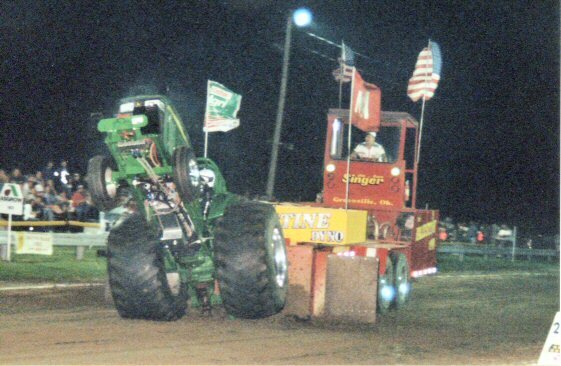 He swerved to miss it, and the rig nearly tipped. It could have been worse. We had 18,000 lbs. 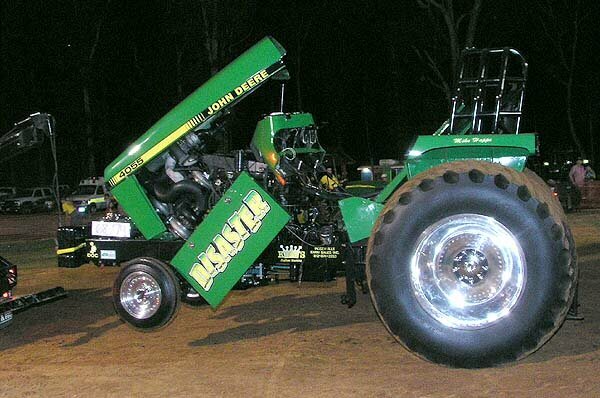 loaded on the tractor. When I swerved the entire rig nearly tipped. When the tractor broke loose, we straightened back up. 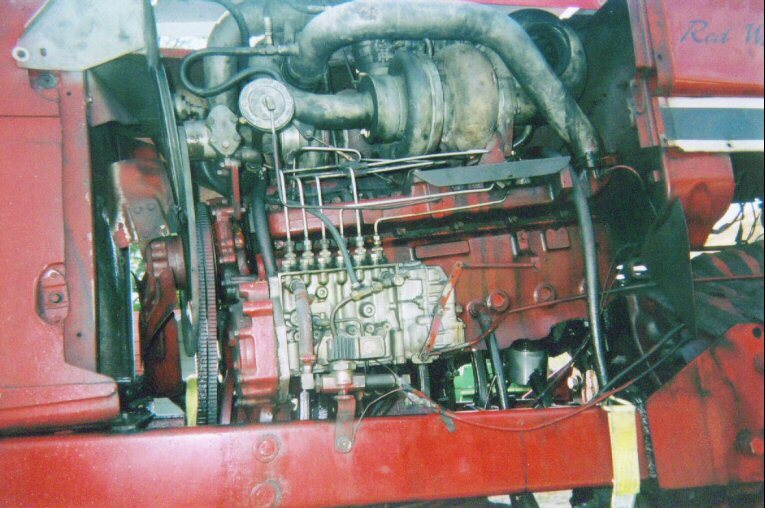 The old IH 1466 that they had started pulling with wound up on it's top in a ditch. 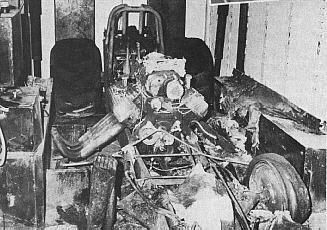 All they salvaged was the motor. 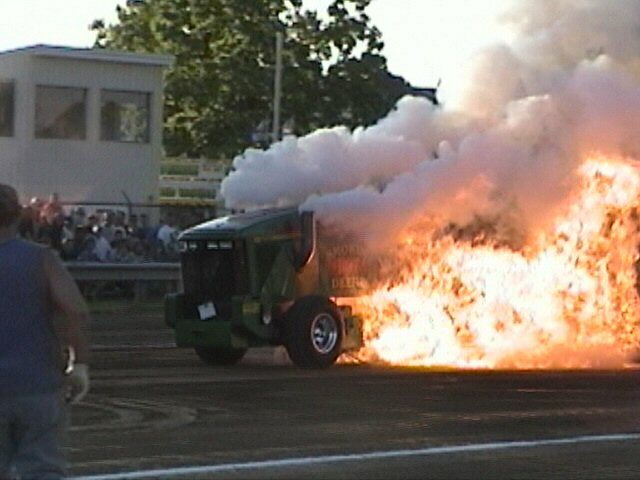 Craig Huff from Ohio was pulling his TWD truck at Ohio State Fair when the truck had an explosion. 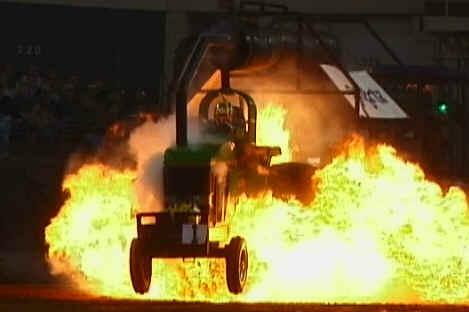 A fire erupted which the track crew had a difficult time getting out. The truck body was completely destroyed and numerous other parts. Copyright Photo's.....Do not take! Thanks to NTPA office and Larry! 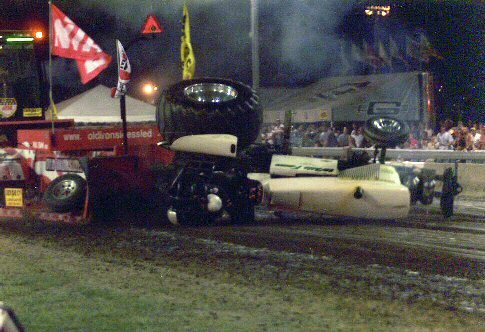 July 24th, 1999 Roger Peterson pulling his Super stock tractor turned over at Hutchinson,Mn. pull. 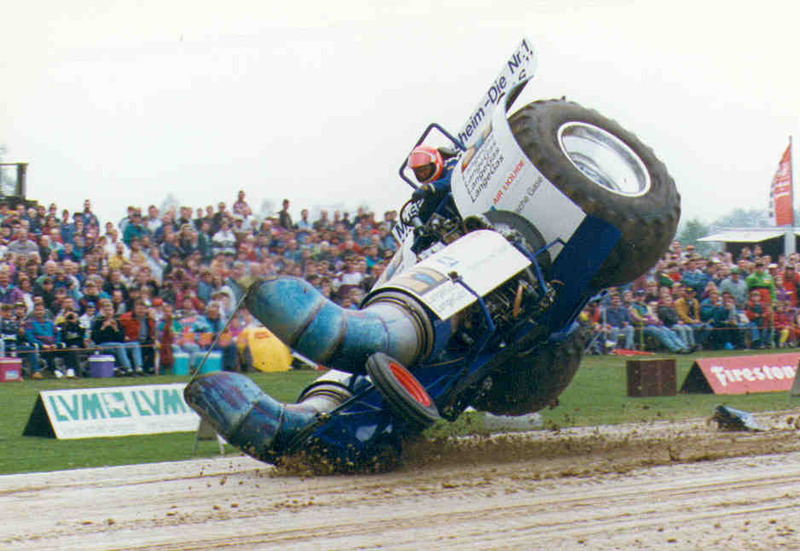 As the tractor took off it became out of control, rocking side to side. 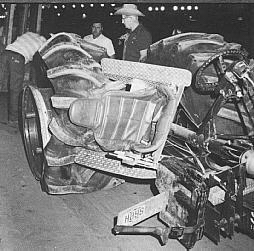 The rear tire came off the bead and rim collapsed. 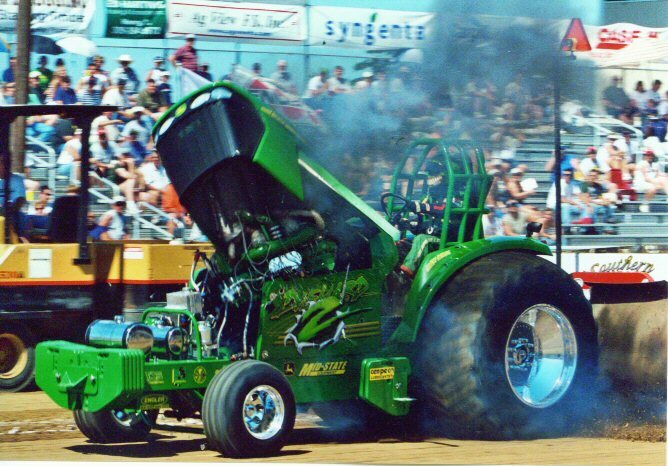 The tractor broke in two behind the engine and the rear part of tractor flipped upside down while still hooked to the sled. Peterson was knocked unconscious for 4 or 5 minutes. He was taken to hospital and later was released to return and finish watching the pull. NTPA's Rollcage Worked! 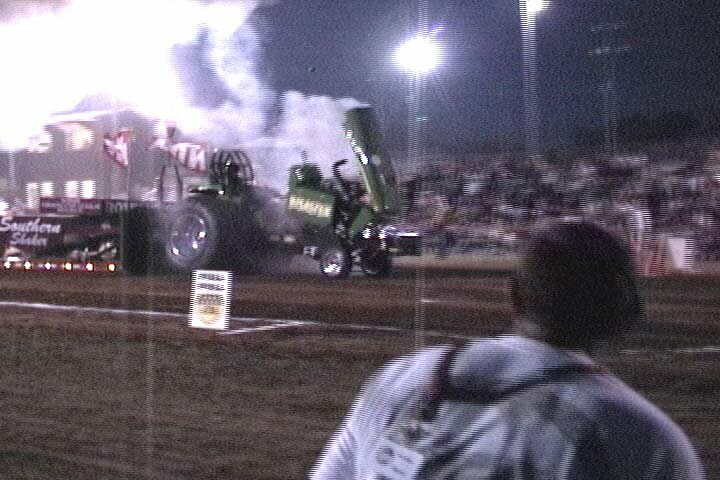 Dennis Johnson on his Super Stock at Fort Recovery,Ohio August 1999! 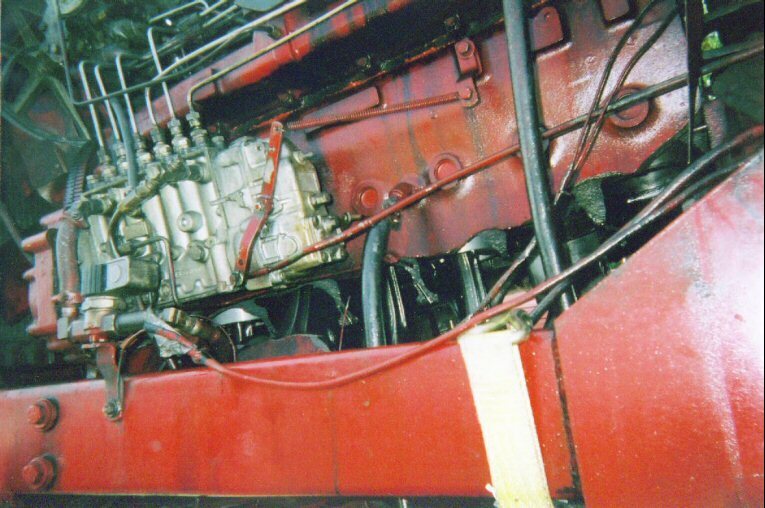 Dennis engine came apart on his pass up the track. 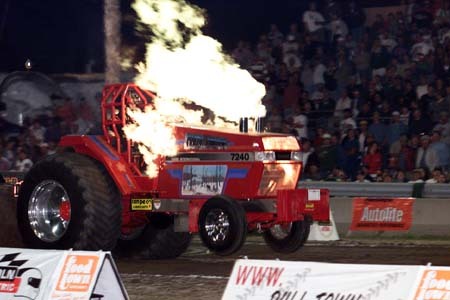 In Sept. 1999, at Spencer, Iowa Matt Goodwin's SS Case IH 7240 had a major engine detonation. 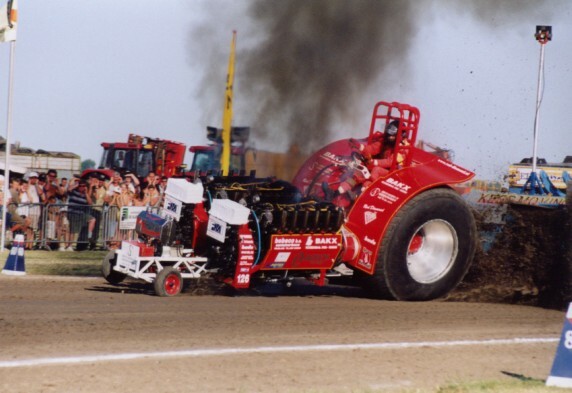 The explosion was so violent that the hood was thrown nearly 40 ft in front of the tractor. 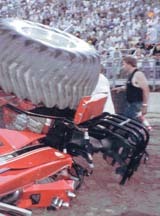 Turbo's, the head and 3/4 of the block came off along with the hood. 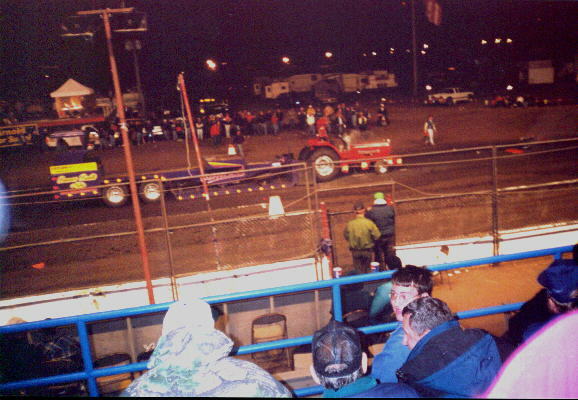 This photo was taken from the Grandstand and as you can see where the parts are still smoking on the ground. No one was injured! 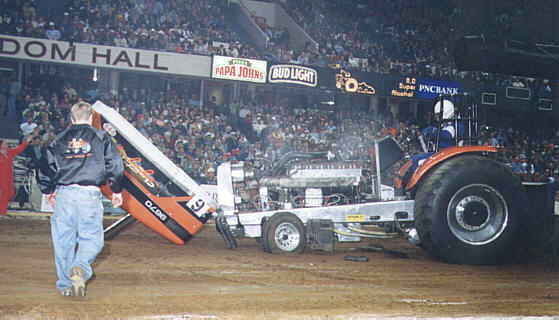 Louisville,Ky Feb 17th, 2000, Dennis Johnson taking a wild ride on his Super Stock Tractor. I added two more photo's here on march 12th. 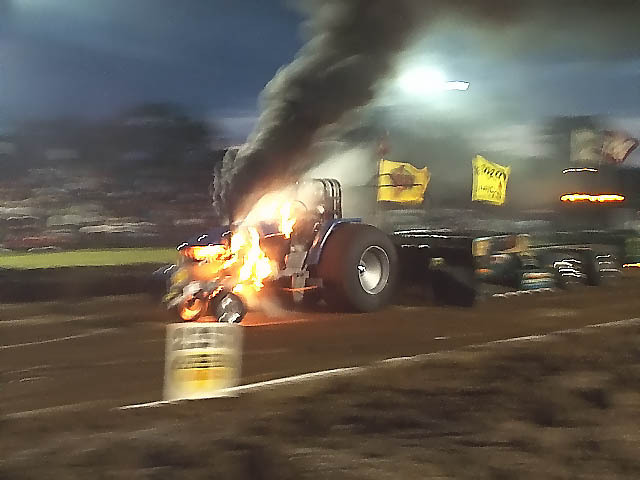 Jeff Hirt's Super on fire at Fort Wayne, In. Jan, 2002. Picture by "Julie Hirt". 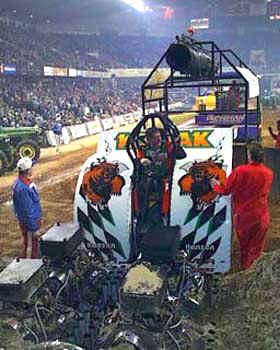 David Richardson's " Kodiak" modified in sand pile after sled malfunction at Louisville, Ky Feb 2002. 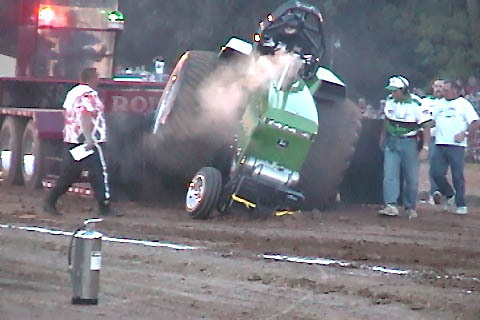 Jim Rand's " White Fawn" John Deere SS has roll over at Bowling Green,Ohio GN 2003. 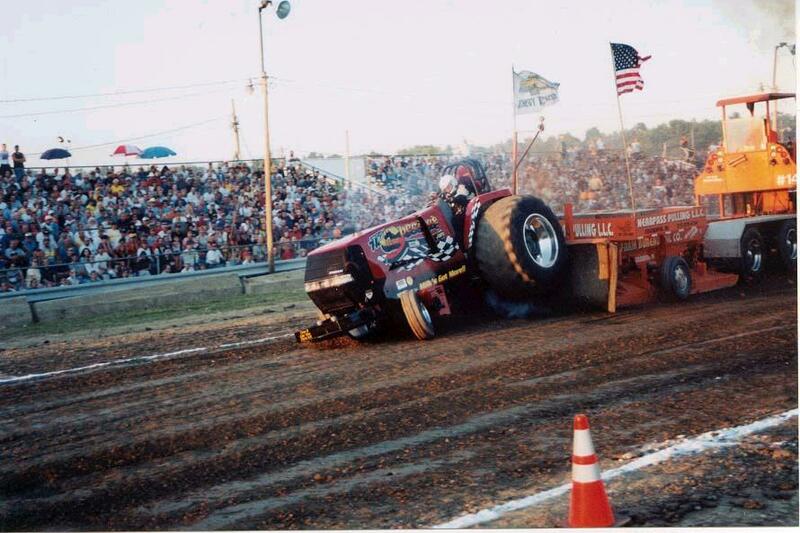 Randy Rose at "Tomah, Wisconsin. 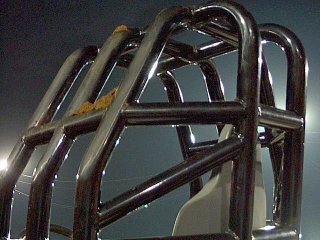 This is why we have roll cages! 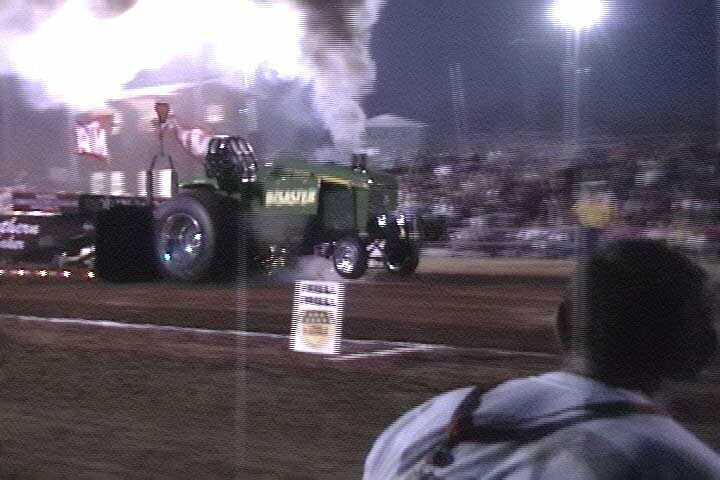 June 12, 2004 at Jackson, TN. 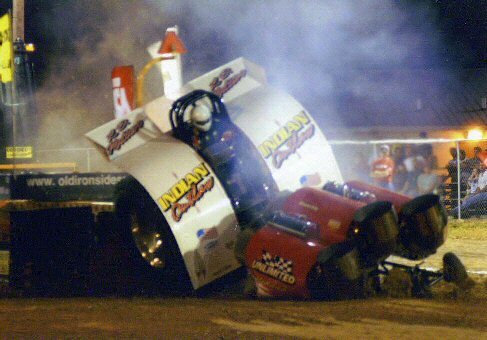 Philip Parish has a wild ride/wreck with his Pro Stock tractor "El Nino". These photo's were taken at Cadzand ( The Netherlands) in 2003. The twin-Griffon "Red Diamond" took a wild ride. PhotoTom La Rue with his new twd truck. 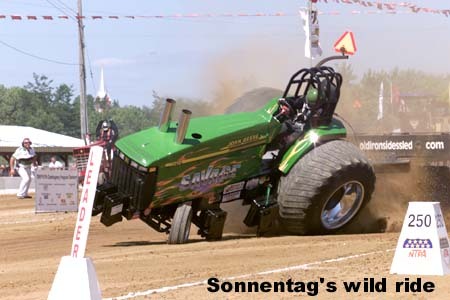 PhotoDave Sonnetag in Tomah 2001. 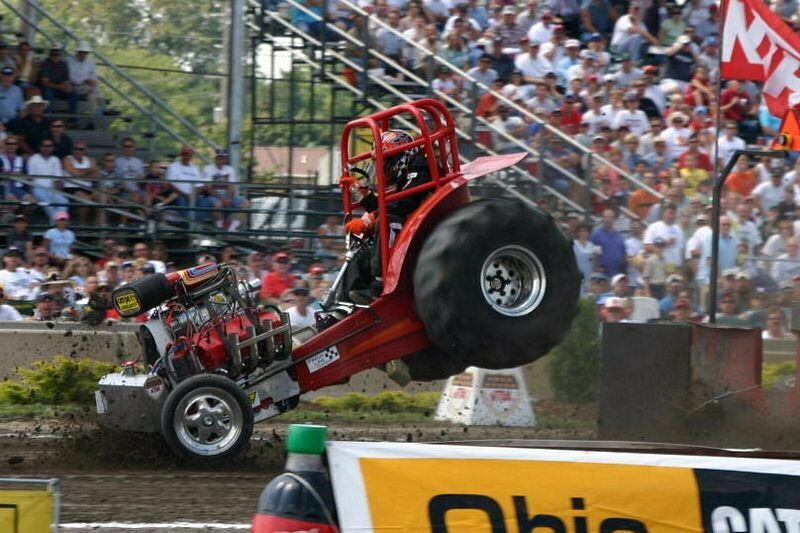 Paul Yates (pcy)SS "Red Warrior" with engine explosion at Brown Co fair, Sept 30th, 2005. Please do not take any of the photo's. Wild Site has been visited times.